No one can touch Office 365 for power and features, and with new cloud and AI improvements it's managing to move with the times... just about. Think business, and you think Microsoft Office, and Office 365 is now the preferred way that Microsoft would like you to buy its productivity suite, thank you very much – by paying them a monthly subscription fee. Right now that subscription will set you back £7.90 + VAT per user per month (if you pay annually) or £9.50 + VAT per user per month (if you pay month-to-month). In the US those prices are $8.25 and $10 respectively, and if you want to try before you buy, there is a 30-day free trial available. There is a Business Premium package too: that's £9.40 + VAT (or $12.50) per user per month (annual plan) or £11.30 + VAT ($15) per user per month (on the monthly plan). You get everything listed below, plus extra admin controls, booking and invoicing apps, intranet support and plenty more, plus the Slack competitor called Microsoft Teams. 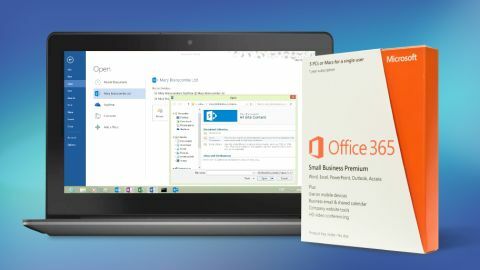 You can still buy Office as a one-off package, in the form of Office 2019 – that might suit smaller businesses and individuals, but you don't get regular updates, and you don't benefit from some of the cloud extras. That will cost you $249.99 per user (UK pricing still to come). Here we're going to focus on the Office 365 version of the software – click the links below to read more detailed reviews of each application, where available. Looking for cheap Microsoft Office deals? Word – Not likely to need any introduction, Word takes care of your word processing needs across computers, the web, and mobile devices. It's not been blessed with a huge number of new features in recent years, but it remains rock solid and very capable. Check here for our full review of Word. Excel – Again, a program most people will be familiar with, and the most powerful spreadsheet application on the planet. Beyond the collaboration features, which we'll discuss further later on, recent Excel improvements have typically been minor rather than major. Check here for our full review of Excel. PowerPoint – Perhaps the Office app most under threat from newer, leaner rivals, PowerPoint remains very comprehensive and powerful, but can feel bloated. In terms of features for your next slideshow though, it remains the presentation application to beat. Check here for our full review of PowerPoint. OneNote – Got notes to take? OneNote will do it for you, although the application included in the Office 365 suite is now being phased out in favor of the Windows 10 universal app version. It continues to do a very good job of enabling you to collect anything digital. Check here for our full review of OneNote. Outlook – Much more comfortable across multiple platforms and the web thanks to recent upgrades, Outlook is still the ultimate in email, contact and calendar management. The only downside is that it's actually too powerful for what most people really need. Check here for our full review of Outlook. OneDrive – The biggest innovation in Office 365, enabling you to sync your files across any device and, crucially, collaborate on documents in real-time inside desktop apps. OneDrive itself may not be that polished, but it's an essential part of keeping the other cogs turning. Check here for our full review of OneDrive. Publisher – You may have forgotten about this, and at times Microsoft seems to have as well, but the entry-level desktop publishing tool is still around for those who need to put together layouts more advanced than those they can manage inside Word. Check here for our full review of Publisher. Skype – Video calling, audio calling, instant messaging, file and screen sharing... it's fair to say Skype has just about everything you could need from a modern communications program, and as an Office 365 subscriber you get access to an improved business edition. Check here for our full review of Skype. Access – Yes, Microsoft's database application is still going strong, and if your business has need for it, then the product is as solid as it ever was. There isn't the same support across mobile and the web as the other apps, but as far as the desktop program goes, you can fully rely on it. In many ways the key features of Office 365 are the list of applications we've just mentioned – you get word processing, spreadsheet and presentation tools for all the users in your organization, and extra programs for tying everything together and managing communication across the company. Recent upgrades have centered around extra artificial intelligence chops, whether that's to surface files you might need in OneDrive or to suggest people who may want a copy of your PowerPoint presentation (folks you've just shared a meeting with, for instance). At the time of writing a new and simplified ribbon is being tested that should make Office 365 even more straightforward to use, and perhaps hide some of the legacy features inside each app that no one really bothers with any more. It should also create more of a unified interface across the web and mobile. And speaking of the web and mobile, the look and functionality of the online and smartphone (or tablet) Office apps has improved significantly – together with AI, it's where you'll find most of the ongoing upgrades to Office are happening right now. It really is now possible to get some serious work done on the go. In the early days of Office 365, it was fair to say that Microsoft was struggling to incorporate cloud features and modern day necessities (like collaboration) into its veteran apps, but most of those problems have been ironed out. Office 365 is now something of a no-brainer for small and large businesses, even if you do have to pay monthly for it. Microsoft's big competitor in the space is of course G Suite, and if you're weighing up the pros and cons of each one for your own business, there's no easy answer. There's no doubt Microsoft has the more powerful and feature-packed suite of programs – Word, Excel and PowerPoint are hard to beat, after all. What the online apps of G Suite offer, however, are slickness, speed, simplicity and access from just about anywhere. They work very well from inside any browser tab, and they're backed up by mobile apps that are getting more polished every year too. Add to that Google Drive, which is several steps ahead of OneDrive in most areas. In many ways it's a battle between new and old, cloud and desktop, though Microsoft has been working hard to improve its online apps and cross-platform syncing services. Ultimately it comes down to the software and features your company needs. Click through on the individual review links we've included above for a more detailed breakdown of the features of Word, Excel, PowerPoint and the rest, but overall Office is as strong as ever. Microsoft pushes out regular updates to Office 365 subscribers, and in recent years they've all been useful and well-judged, focused on AI, the cloud, and mobile – the areas that matter in today's computing age. We'd certainly say the monthly fee you pay for Microsoft Office 365 is value for money and then some. As to whether you're going to use all the functionality and features on offer, or whether you'd be better off with Google and G Suite, that's a question only you can answer.